X 7536 (on campus) to schedule your appointment. All patients are seen on an appointment basis. Emergencies are seen immediately. Due to the limited number of appointments available, patients are asked to call and cancel an appointment if you are unable to keep it. Also, you must be checked in 15 minutes prior to your medical or Well Women’s appointment or your appointment will be canceled. You will be rescheduled for the next day appointment. 9-911(on-campus) or 911 (off campus). You can also contact Ramapo College Security at X 6666 (on-campus) or (201) 684-6666 (off campus). This will activate the Ramapo College Emergency Response System. Health Services is NOT an Emergency Department and cannot provide the level of care that Emergency Department does. 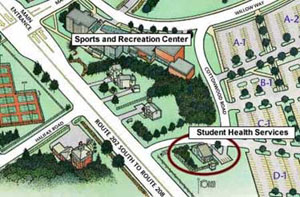 Health Services is a part of the Division of Student Affairs. It is located near the campus South Gate entrance at the corner of Route 202 and Hornbeam Road. Monday-Thursday: 8:00 a.m. – 5:15 p.m.
All currently enrolled students are eligible to use Health Services free of charge. 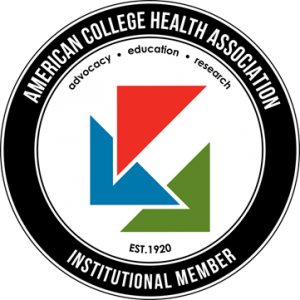 Once a student graduates or separates from Ramapo College of New Jersey, he/she is no longer eligible to use the services of Health Services. All patients are seen on an appointment basis only. Diagnosis, treatment and management of acute common illnesses and injuries. entrance to the main parking lots .